After a whirlwind few days of finishing work on Friday (delicious), attending the magical Mary Poppins musical and visiting the Christmas lights on Franklin Rd on Saturday, recovering on Sunday and preparing on Monday to host our entire family for Christmas dinner, I am exhausted. I am not leaving the house today unless its on fire. It is raining so I am not leaving the house. We have leftovers for days so I’m not leaving the house. Santa aka ME, outdid himself herself and finally managed to track down the original Star Wars Trilogy box set on DVD (all versions from retailers are on Blu Ray wth?) and Dave, Ethan and I are in the middle of a nerd movie marathon. 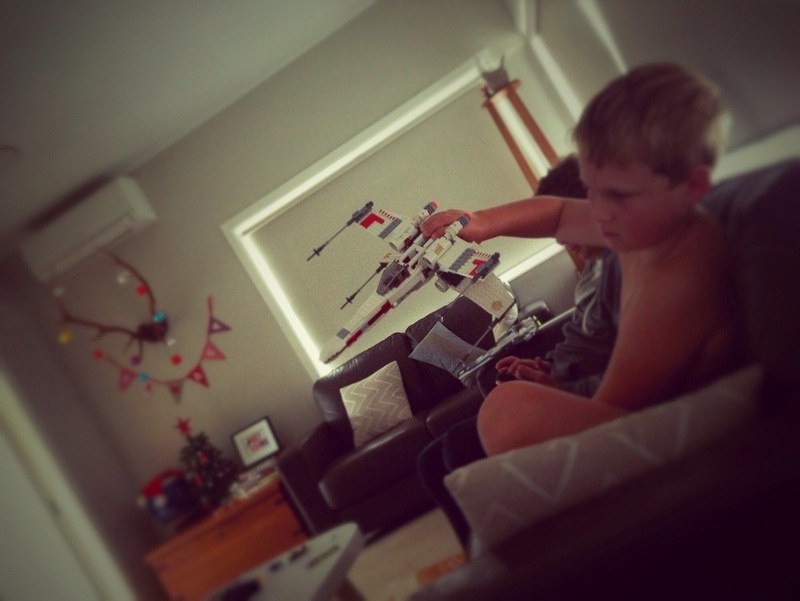 I have been waiting for this day since E was born, and finally the resurgence of Star Wars Lego has piqued his interest to the point where he is glued to the couch clutching his large X-wing fighter – rather awkward by all appearances. I am SO not even leaving the Lazy-Boy!